32 FT. X 36 FT. - OUR LOVELY GENEVA SUITE, NAMED FOR THE CO-OWNER BONNIE'S MOTHER, IS VERY COMFORTABLE AND ELEGANT AND IS A WONDERFUL PLACE TO RELAX AND ENJOY ANY TIME NIGHT OR DAY. 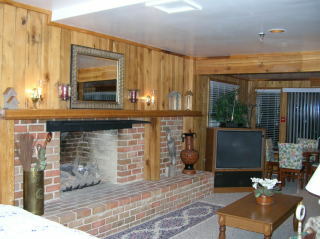 THIS SUITE HAS A BEAUTIFUL WARM FIREPLACE, A KING SIZED BED, ONE QUEEN SIZED BED AND 2 LARGE SOFA'S. THE KING BED AND THE QUEEN BED ARE SEPARATED BY A WALL. BOTH SOFA'S PULL OUT INTO QUEEN BEDS. THERE IS TABLE AND CHAIRS FOR DINING AND THE SUITE HAS IT'S OWN BATH WITH SHOWER. THE ROOM EXIT'S OUT ONTO IT'S OWN LARGE DECK. 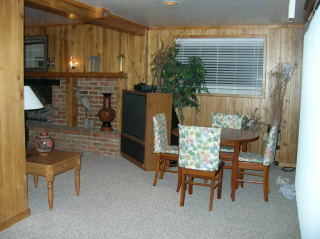 THE SUITE ALSO HAS A LARGE SEATING AREA THAT COULD BE USED FOR SMALL MEETINGS OR A GET TOGETHER WITH FAMILY AND FRIENDS. 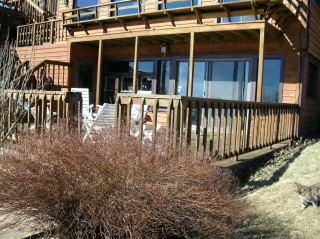 IT LEASES FOR $150 PER NIGHT FOR 2 PEOPLE, $25 FOR EACH ADDITIONAL PERSON. $50 NON-REFUNDABLE DEPOSIT. 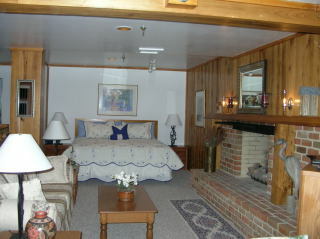 VIEW THRU FIREPLACE/PULLOUT SOFA AREA INTO VIEW OF KING SIZE BED IN THE GENEVA SUITE. LARGE DECK OUTSIDE THE GENEVA SUITE. DINING TABLE SEATS 4 IN THE GENEVA SUITE. FIREPLACE IN THE GENEVA SUITE.